Although our minds believe our bodies to be fixed and static, in fact, we are comprised of energy – living, breathing, expanding and contracting energy. Every thought, emotion, belief, attitude and experience is stored as energy in the body. While extreme energies like hatred and love are more easily felt, all emotions, feelings and attitudes have a particular vibration. These are stored in the body, beginning at conception. The feelings thoughts and beliefs we gather as we grow up become who we believe ourselves to be. This wiring feels very real, just as our bodies are real to us. Some of the thoughts and feelings that we have about ourselves are life-giving and supportive, but there is not a human being alive who does not also have very destructive thoughts and beliefs. Even birth itself is a violent, terrifying ordeal. Then childhood, no matter how well done, is filled with disappointment and hurt feelings and misunderstandings from the point of view of the child. This imprinting is hardwired into our bodies. The way we hold ourselves in our posture, the way we feel about ourselves internally, and much more, are determined by this wiring. The hurts and fears of childhood do not just go away on their own; they must be felt and purposefully released. Otherwise, like any energy, they continue to work on us without our knowing. Trauma, abuse, abandonment, trust issues, and so on are all stored in the body. These experiences do not need to be relived over and over again, they just require being felt and let go. This is our true work. There is no way around this. Other emotions, such as love and acceptance, also live in our bodies, but it is part of our human conditioning to hold onto the more life-threatening emotions and feelings. This wiring was vital for our evolution. We needed to remember and know in our bodies where danger lurked in order to avoid it. It is now important to remind ourselves, consciously and intentionally, that we are safe, that we are loved, that we have much for which to be grateful. Of course, sometimes we will be in actual danger, or someone may threaten us, lie to us, and so on. Having felt our past wounds leaves us in a place to respond more powerfully and appropriately. Moreover, if we are clear about who we are in the present and not constantly reinforcing old injuries, our energy systems can feel imminent danger. If we are connected to our own truth, we recognize truth in the other. It is usually our old injuries that we refuse to look at or feel again that get in the way of feeling connected to the other. Not having felt our past wounds leaves us in a near-constant state of defense. 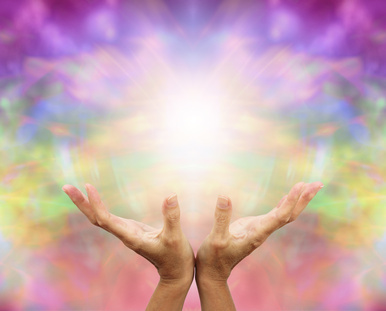 In this state, the energy we put out is like a force field that keeps us (we believe) safe. It can be quite scary to imagine life without this defensive energetic force field. But living behind that mask is far worse. I set the intention, on a daily basis, to feel into the truth of who I really am, through my feelings, not around them. It is both challenging and rewarding. The alternatives are anything but rewarding; for example, living in a drug-induced fog, or the fog of consumerism, hatred, addiction, etc. of any kind. Resistance to feeling our feelings, causes a block in our system. Life cannot flow through such blocks. True emotions are like a wave, they come and go. Yes, there is an impact on our being and on our mind, but it is fluid. If you watch a baby, you will see the constant flow from happy and wanting connection to rage and then to contentment. Babies do not have the distinction good and bad. They just allow themselves to feel whatever is there. In childhood, we are taught things like don’t be upset; it’s not appropriate to be angry; and, even that there is danger associated with too much happiness. Our minds then learn to control the energy of what was once free-flowing emotion. Negative emotions have a particular feel to them – they are more dense. Add resistance to this density, and tension is created – tension that is stored in the body and causes pain, tightness, illness. This dense block is also felt by the other. We yearn for connection, but stand before the other with a dense block which defeats our greatest desire. Practice experiencing how various emotions feel in your body. Practice sitting and being with whatever comes up emotionally. Allow the feeling to pass without any judgment. We are feeling creatures. It is both a blessing and a curse that we then also have judgment. There is absolutely nothing innately wrong with any particular emotion even though some feel pleasant while others are challenging. If consciously seen and felt, emotions will shift on their own. It is only our resistance that keeps them stagnant – which is the root of most of our pain.